We’re busy. If we’re not running off to school before the sun comes up, we’re getting ready to ski as the sun comes up (you gotta sleep in a little!). For years, I was one of those parents who not only prepared all of our food, but made it by hand. Gerber baby food? I think not. Not when I can bake sweet potatoes and process them myself. And so it went. I even went through a stage of making homemade saltine crackers. Crazy. And then we got busy. Now, we’re all about efficiency. That doesn’t mean we’ve started eating Hostess Snow Balls or packets of chips for a daily snack. But I don’t have time anymore to make homemade granola bars, so when we go skiing, we’ve had to simplify and buy (horrors!). 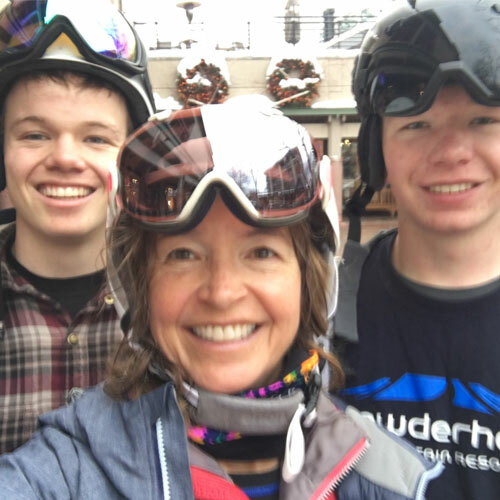 One of the best pieces of advice I’ve ever received about family skiing is the admonition to “keep ’em fueled.” Not the car (although that’s good advice too, who wants to stop for gas when your skis are loaded and the lift opens in 30 minutes? ), but the kids. Hungry kids are whiny kids, but more importantly when you’re skiing, hungry kids are cold kids (which of course, leads back to whining). Even when our kids were little, they didn’t really want to stop skiing, so they’d get hungry, go past the point of no return and yikes! the fun was over. We had to carry pocket snacks. Here are some of our faves. M&Ms – While you don’t want to load up too much on sugar (happy kids are your goal, not hyper kids), the quick burst of energy provided by a few M&Ms is much better (and easier on your teeth) than eating a frozen Snickers bar on the lift. Even when frozen, M&Ms are manageable. PB&J – We make these on “skinny bread,” those flat sandwich rolls with only 100 calories. It’s not the low calories which are attractive, but rather their mash-resistant quality. Slather these babies with peanut butter and jelly and pop them in a sandwich bag. You’ve got a snack, or lunch, on the go. Don’t like PB&J? Try sliced turkey with mustard. Cheese Sticks – I love cheese in any guise or form, so these are a great way for me to get protein. The downside is the wrapper. It can be hard to open with cold fingers. A better option might be to slice your own cheese and put it in a ziplock bag. Hard-Boiled Eggs – This may sound a little sketchy and I’m not sold. But one of our sons loves eggs. Boil, cool, peel and put in a bag with salt. He thinks it’s a great easy snack. Just don’t fall on it. Nuts – Peanuts, mixed nuts, cashews, really anything but pistachios (who wants to deal with those shells?). Accidentally drop a nut off of the lift and the squirrels get a bonus. Sliced Apples – The success of this snack depends up on your tolerance for browning apples. If you slice them and bathe them in lemon juice, they won’t brown. The brown won’t hurt you, but most kids think its icky. Granola Bars – You may be able to score some for free at your resort. Nature Valley seems to sponsor just about every resort, and if they aren’t there, chances are you’ll find Cliff or Larabars. Mini Cliff bars are a great size, but get hard when cold. Ditto mini Larabars. Granola, having less moisture, is always hard, but edible. My current favorite bars are Nature Valley’s Roasted Nut Crunch. Like KIND bars, but much cheaper. Water – Even mild dehydration will make your heart work harder and make it harder for your body to regulate temperature. My husband and I both ski with winter Camelbaks (insulated to prevent freezing). We’ve become expert at squirting water into our kids’ mouths on the chairlift. EVOL Burritos – Looking for a snack that isn’t sweet? We love these mini burritos and bike with them in place of energy bars. They’ve got the right ratio of protein to carbs. They are made with organic ingredients, so despite the fact they come in a plastic wrapper, they are almost “homemade.” The downside is that you can’t really eat them on a lift. While you can pop a frozen one in your pocket as you leave home, there is no guarantee your burrito will thaw by 11:00. If the lodge has a microwave however, you’ve got a great, nutritious, quick lunch. For more information on EVOL burritos, check out my review. Mix1 Shakes – Another yummy treat we discovered through biking, Mix1 shakes come in small plastic bottles that will fit in your pocket (I have no idea if they are fall resistant). We haven’t drunk them before skiing, but do think they are a satisfying post-skiing snack, in the car, on the way home. Mix1 shakes are formulated to provide pre-workout fuel and post-workout recovery, with a 2 to 1 carb to protein ratio (all-natural whey protein), fiber to keep your blood sugar stable and olive oil to help to fight inflammation. They are stuffed full of antioxidants (supposedly one shake equals 3 servings of fruit and veggies, but how could you tell?) The shakes are also lactose, gluten, soy and caffeine free. What I like about them, is they taste great! Kind of like drinkable yogurt, but less thick. They aren’t too sweet, but they are quite tasty. I love the mango. I am less a fan of their “lean” shakes which, while they have fewer calories, are sweetened with stevia. I just don’t like the taste as well. One of the claims made by Mix1 is that drinking a shake after a workout will help recovery by feeding your body the right mix of protein, carbs and healthy fats. This combo is meant to prevent muscle breakdown in the 15-45 minutes after exercise. We decided to test this by drinking shakes after a hard cross-country ski where we were breaking trail most of the way. While it’s impossible to tell if we would’ve felt sore the next day if we hadn’t drunk the shakes, we felt great (no sore calf or hip muscles) and we enjoyed drinking them. I once read something that said if a food claims to have health benefits, you should avoid it and run the other way (this was in regard to specially-formulated tortillas that purportedly could lower cholesterol). I think this is generally good advice, which is why I won’t make any claims as to the health benefits of Mix1. Bottomline: They taste delicious and they are a much better post-skiing choice than potato chips. They cost more, but they are also easier to eat than an orange (no peeling!). So there’s a quick rundown on some of our favorite ski snacks — tried and true and brand-new. What do you and your family pack for pocket food? What snacks work and which don’t for you? Please share! Thank you to Mix1 for sending a variety of shakes for us to try. While my husband and sons had enjoyed Mix1 at a bike race this summer, I was new to them. As always, all opinions expressed are my own and are exactly what I would tell my family and friends. © 2011 – 2018, braveskimom. All rights reserved. Any use or publication of content, including photos, requires express permission. These are some great snack ideas. It’s so hard to find quality kids snacks that they’ll actually enjoy. I found these a while back and they haven’t steered me wrong yet. Kids love em, they’re organic, and they come in a crazy amount of flavors. Thank you so much John for the lead! Cheers! No chocolate among your food recommendations? I find a hot mocha is a great after ski drink. It tastes great and keeps you alert for the drive home. Don’t know if you’ve had landjaeger but it is a tasty and handy dried Austrian type of salami. It has a good bit of fat but I figure that isn’t bad when skiing. I’m sure there are similar alternatives available. M&Ms are the only chocolate — you’re right! Mocha sounds great. Like those after biking too! You are so right about how one should always have a pack filled with fuel for the kids. Not to mention, your wallet does not shrink to half if you don’t have to visit the restaurants, unless you are in the mood to indulge (I save that for when my wrestling boys are not with me). Your boys sound like mine! You and I should ski and then we can indulge! Cheers! Great list of snacks! Our kids are still young enough that frequent trips to the lodge are a given, so we pack lots of little things that they can eat on each ‘warm up’ trip inside. We tend to pack a high-protein tabouleah salad with chick-peas for lunches and lots of granola bars, fruit and home-made cookies that go well with a shot of hot chocolate from the thermos. I came across a recipe for a spread made from apricots, yogurt and cream cheese that is perfect with graham crackers – another ski hill fave! Tks for sharing and have a great season! Yum! Such good ideas. That spread sounds delicious. Thank you and have a good season too!